The National Film Board of Canada is set to release the DVD box set Jacques Drouin: Complete Pinscreen Works on December 2, 2009. Drouinâ€™s is known for creating beautiful shorts using the AlexeÃ¯eff-Parker pinscreen. The box set will be launched at a tribute to Jacques Drouin at the Sommets du cinÃ©ma dâ€™animation, at the CinÃ©mathÃ¨que quÃ©bÃ©coise, on Saturday, December 5 at 5 p.m. The event will include a screening of the documentary portrait Jacques Drouin en relief, by Guillaume Fortin. 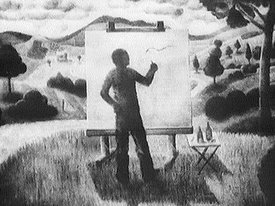 The box set brings together the six animated shorts Drouin made at the NFB, including his now classic Mindscape (1976), all digitally restored for the collection created to preserve significant film works for the collective memory. Bonus features include four student films, two trailers and several animated sequences with the directorâ€™s commentary, as well as Jacques Drouin in Relief. Made specially for the box set, this documentary portrait offers new insights into the work of an outstanding artist. Complementing the films is a bilingual booklet containing essays by animation experts, Drouinâ€™s notes and other invaluable archival documents. A National Film Board of Canada production, the box set Jacques Drouin: Complete Pinscreen Works goes on sale at the NFBâ€™s online store on December 2, 2009. It can by purchased by phoning 1â€‘800â€‘287â€‘7710 or visiting the website www.nfb.ca/boutique. Shrek fans will get their first peek at Shrek Forever After beginning December 18 when a trailer debuts before screenings of James Cameronâ€™s Avatar. The story picks up with Shrek feeling down, losing his ogre-ness, seeing what life would have been like had he not been born. Had Shrek not been around, Donkey would have been forced into cart-pulling duty, Puss in Boots would have traded in his sword for a pink bow and Rumpelstiltskin would rule the kingdom. As far as new cast members go, Kathy Griffin and Kristin Schaal will voice ogre-hunting witches, while Jon Hamm will voice an attractive ogre who just so happens to be the leader of an underground resistance group. 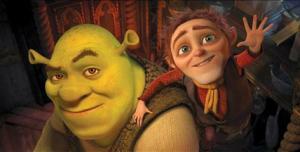 Shrek Forever After is scheduled for theatrical release May 21, 2010. Family Guy: Something Something Something Darkside is an hour-long episode of Family Guy that parodies Star Wars Episode V. It will be available on DVD and Blu-ray Disc December 22, 2009. Disney’s Prep & Landing is an all-new holiday special made exclusively for ABC. It will air Tuesday, December 1st at 8:30pm, and will be availabl on Disney.com on December 2nd. Check out a behind-the-scenes video after the break. Check out this Pixar short featuring George and AJ from Pixar’s Up. And because you’ll probably wonder — yes, this is how it’s supposed to look. My guess is that this was a test short and if approved by Pixar bosses would have been fully animated. Instead, we’re left with this animated storyboard-like short, which I actually enjoy a lot. SuperNews! Presents: Linked in… to what? 11/22/2009 | Music Video Spotlight | Comments Off on SuperNews! Presents: Linked in… to what? When the Cat’s Away is a 1929 Mickey Mouse short film produced by Walt Disney and Ub Iwerks. In the film Mickey and Minnie are portrayed the size of regular mice, whereas Tom Kat is the size of a person. The Barnyard Battle (1929) is a Mickey Mouse short film first released on April 25, 1929. As the title implies it featured a battle between an invading army of cats and an army of mice trying to defend their homes and farms. The Barn Dance, first released on March 14, 1929, was the first of twelve Mickey Mouse shorts released during that year. It was directed by Walt Disney with Ub Iwerks as the head animator. The Gallopin’ Gaucho was the second film featuring Mickey Mouse to be produced, following Plane Crazy and preceding Steamboat Willie. The Walt Disney Company completed the silent version on August 7, 1928, but failed to distribute it widely. Due to a lack of interest, the film was not given wide release until after Steamboat Willie and Plane Crazy had been released, making it the third Mickey Mouse short, with the sound version released on December 30, 1928. Plane Crazy was first released on May 15, 1928, and is the first Mickey Mouse cartoon to be released. It was initially released as a silent film, with a soundtrack added later by Carl W. Stalling and released on December 29, 1928. The short was co-directed by Walt Disney and Ub Iwerks. Iwerks was also the main animator for this short and reportedly spent six weeks working on it.